Our Audiologist, Dr. Anita Carroll established “The Gift of Hearing” program to GIFT a set of hearing aids at no cost for an adult in need of hearing assistance. Based upon compelling story – not financial need. Nominate yourself or deserving individual to receive this “Gift of Hearing”. 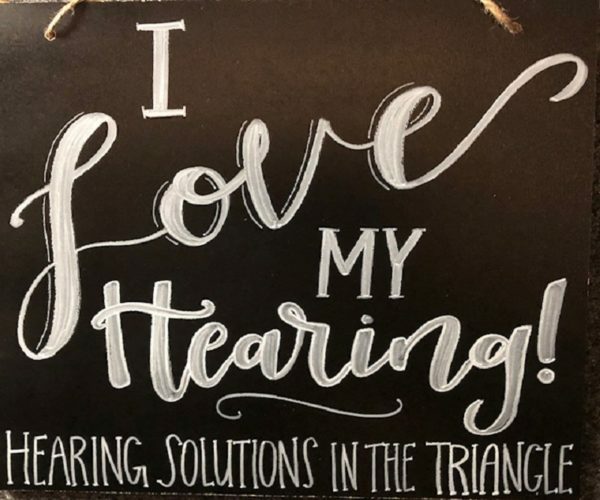 Hearing Solutions in the Triangle, PLLC will accept nominations through December 21, 2018. It is Anita Carroll’s mission to honor her father, Edward C. Matthews by providing “The Gift of Hearing” so that others could enjoy better communication and to Pay It Forward. The recipient will be awarded a set of hearing aids (including fitting services) that are appropriate to their hearing loss. Financial information is NOT requested or required! (See rules below for selection process.) All nominees will receive a free hearing screening to determine hearing aid candidacy and eligibility. Download this form and submit it by email or print and mail it to our office. Write a brief letter (or email) sharing their special story and why they would benefit from hearing devices. Nominations can be made by self, relative or friend (with nominee’s consent). All entries must be received by 5 PM December 21, 2018. Nominees will be scheduled for a free hearing screening to determine eligibility. Required hearing aid fitting services are provided to the recipient at no cost. The winner will be announced December 31, 2018. Winner is selected based on their communication need (determined by hearing level, professional or educational necessity, impact on quality of life and compelling story). The recipient of the “Gift of Hearing” must be over 21 years old and may be required to release his/her name. All decisions are final with no right of appeal. Family members and employees of Hearing Solutions in the Triangle, PLLC are not eligible. Randy A. of Chapel Hill, NC was chosen as recipient of the 2017 Gift of Hearing award! He has a long-standing history of hearing loss and recent medical concerns which made his hearing his last priority. Randy was nominated by his wife so that he could reconnect to life again. He needed better communication with his family, work and his medical providers. He received a pair of state-of-the art hearing aids and fitting services at no cost from Hearing Solutions in the Triangle, PLLC. His new hearing will impact his life and relationships. Randy, we want you to Hear Well for Life™ and enjoy getting back in the swing of life again! Enjoy! John S. of Cary, NC was chosen as recipient of the 2016 Gift of Hearing award in December, 2016! As a veteran and caregiver, his listening demands are high and wants to prioritize his hearing again. John was nominated by his daughter in hopes of engaging in “in-person” conversations again with his family and friends. He received a pair of state-of-the-art hearing aids and fitting services at no cost from Hearing Solutions in the Triangle, PLLC which will certainly improve his quality of life around others! John, we want you to Hear Well for Life™ at home and at work!